WAM was such a success last year at Days Hotel that we're going back. 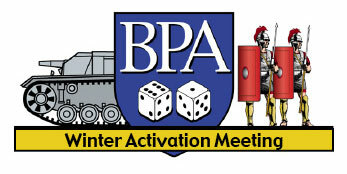 On Thursday, January 22 through Sunday, January 25, 2009 in Timonium, MD, BPA will again be hosting Winter Activation Meeting (WAM VII) during the calm before the storm which is the week before the Super Bowl. The focus of this four-day event is to provide a gaming convention for the two-player historical "card-driven" boardgaming community. Experienced, competitive, fun, two-player, historical card-based strategic boardgamers. Who else would commit to playing a game for 16 hours per day, for five rounds, over three days? Not many. Of course, we encourage any interested boardgamers to attend the convention and give the games a shot. However, it is expected that players will have a thorough understanding of the rules for each game that they choose to play. The GMs are likely to be playing in their own events. These games were selected due to interest expressed in the general gaming community and are those that we enjoy hosting and playing. Obviously, participants, as always, will need to make choices. After losing a game, some players will choose to move to a new event, while others will continue to play for the experience. Of course, winning an event championship is likely to require wins in every round. Face it, we are experiencing symptoms of withdrawal from our wonderful experience at WBC in August. We realize that there are many events in the winter and spring. We have no desire to detract from those tournaments. However, we wanted to run something over the winter close to Baltimore's major airport (for ease of travel for both drivers and fliers) that would appeal to the WBC "card-shark" gang without the distraction of competing events. Late January during the lull before the Super Bowl seems to fit the bill. LODGING: BPA has obtained a very favorable group room rate of $79 per night plus applicable state and local taxes (currently 13%) at the Days Hotel in Timonium, MD. The hotel is newly renovated so enjoy this rate for the last time. Prices will be increasing next time. To obtain this rate you must identify your affiliation with the BPA's WAM gaming conference and make your reservation before January 12th, 2009 (or when our roomblock sells out, whichever occurs first) at 410-560-1000 weekdays between 8 AM and 7 PM EST. After January 12th, reservations will be accepted on a space or rate available basis. Alternately, you may contact Days Hotel, 9615 Deereco Rd, Timonium, MD 21093. Be sure to identify your affiliation with our group - both to get the best rate for yourself and to credit our group with your stay. Room options include one king or two queen size beds. King rate is an additional $10/night. (www.dayshoteltimonium.com) Chili's restaurant is attached to the hotel and open for lunch and dinner. Light Rail: From the Light Rail (MTA) Light Rail HOURS OF OPERATION: Monday - Friday: 6:00 a.m. - 11:00 p.m Saturday: 7:00 a.m. - 11:00 p.m. Sunday and Holidays: 11:00 a.m. - 7:00 p.m. (Direct Access from BWI Light Rail station) Get off at the Timonium station stop. Upon exiting the station walk/turn right down Deereco Road (towards Padonia Road). The Days Hotel is about 1/2 mile ahead on the left. Driving: From North and South Via interstate I-83: Take I-83 to Exit #17- Padonia Road. Go East on Padonia Road towards Timonium. Turn right onto Padonia Road off the Exit Ramp and stay in the Right Lane. Make a Right at the first traffic light. This is Deereco Road. The Days hotel is the first entrance on the right. There is a large parking lot in back of the Hotel, if the front lot is full. Additional parking is available at next two buildings past the hotel, if the hotel lot is full. From North and South Via interstate I-95: Take I-95 to I-695 North towards Towson. Take Exit #24 to I-83 North. Go North on I-83 approximately 2 miles to Exit 17- Padonia Road. Follow Directions from I-83 above. From the West Via Interstate I-70: Take I-70 East towards Baltimore. Take Exit #89 to I-695 North towards Towson. Take Exit #24 to I-83 North. Follow Directions from I-83 above. Open Gaming/Unofficial Tournaments: We have the space from Thursday, 2 PM to Sunday, 6 PM. Participants may open game as space permits. General Tournament Formats: Swiss Open/Five Rounds: Each event will run for five rounds (allowing drop-ins for any round). If you want a top finish, you must participate in all rounds of an event. First Round Seeding: Events will be seeded for the first round (matching players of similar skills when possible). GMs will use a combination of previous WBC tournament finishes and AREA ratings for establishing these first-round matchups. Newcomers to an event usually will not be matched against experienced tournament players for the first round. After the first round, players with similar records continue to match off (much like a single elimination tournament as long as you win). Prizes: The top finisher in each official tournament will receive an official BPA plaque. Additionally, the top six places in each will add to their BPA laurels. An event is laurel eligible only if it draws sufficient participants. RULES AND REGULATIONS: All of the rules and regulations for attending the annual WBC convention will also be in effect at WAM. Paths of Glory (GM - D. Dockter): PoG will use the same format and rules used at the August WBC tourney (see http://www.boardgamers.org/yearbkex/pogpge.htm). Players of PoG will notice only two differences from the WBC tourney: a tie is an allied victory and there will be no peace terms. Players will bid VPs for side and should take into account these changes. Twilight Struggle (GM - K. Wixson): We will use the clarifications current on the GMT Games website as well as boardgamegeek and consimworld websites. Players will bid IPs (to be given to the US at the start) to play the USSR. 1960 (GM - T. Coleman): Players may agree on sides. Otherwise, players bid openly, and loser of bid gains that many cubes to be placed during initial setup. Wilderness War (GM - K. Wixson): Sides will be determined randomly. Special Rule: Starting with the L57 turn, at the beginning of every turn (after the cards have been dealt and examined but before the first impulse) the British player may retrieve one British Regular or Highlander card from the discard pile after randomly discarding one card. Play would then proceed as normal. Last updated 12/17/08 by kae.